Last week I took 3 days of classes at the International Quilt Festival in Houston. Imagine my surprise when I saw a sophisticated bookbinding class in the festival catalogue. 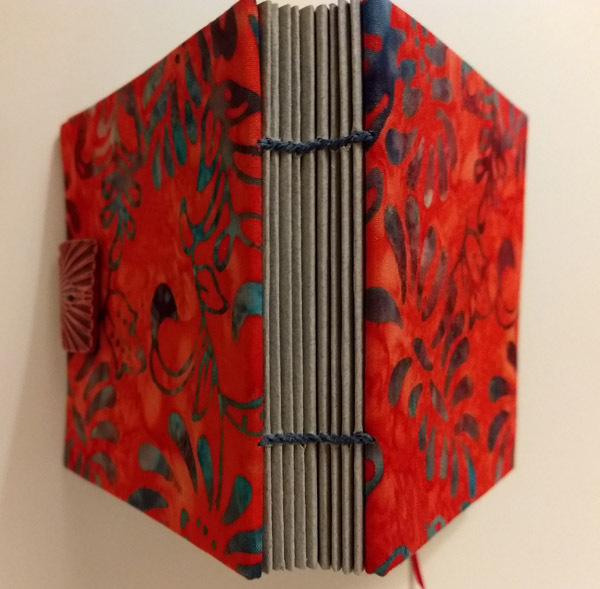 Lisa Louise Adams, a quilter and bookbinder from Hawaii, brought many beautiful, different types of her books to show us, and provided each of us with a pre-cut kit so we could finish the book in one day. 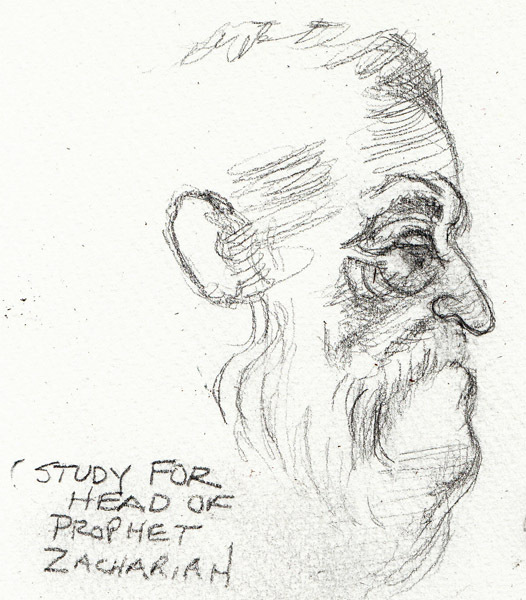 Coptic books open flat, making them good sketchbooks. I taught myself to make two, from books and videos in 2013, but never mastered the two needle stitching pattern. So this was the perfect class for me. I'll post information and photos on the 2 days of surface-dying in the next month. Both were classes on "shibori" one using real indigo dye and the other using an indigo color Procion MX dye. 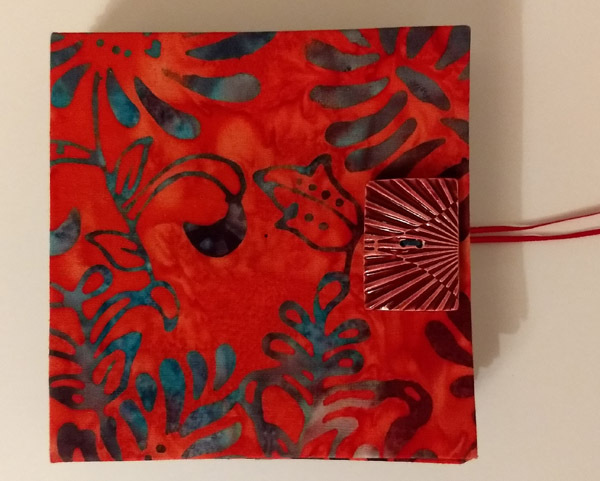 Finished Book: We each chose our favorite batik fabric, paper strips for an accordion, signatures, button, and thread color. This is my finished book. Full Cover: The book opens completely flat. The spine to show the Coptic book chain stitch which binds the concertina, signatures, and covers in place. 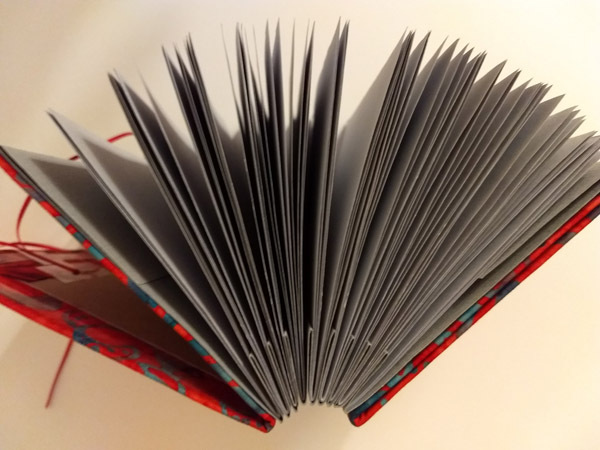 Unlike my traditional Coptic books, this one has a concertina (accordion folded Mi Tientes paper), into which each 4 folio signature was stitched. And the cover was a fabric-covered, folded piece of binders board that made it unnecessary to punch holes on the outside of the covers. You can see an example of the folded cover on the left - I still need to glue it shut now that I added a ribbon for closure. The paper will be good for sketching and the small size will be easy to carry. 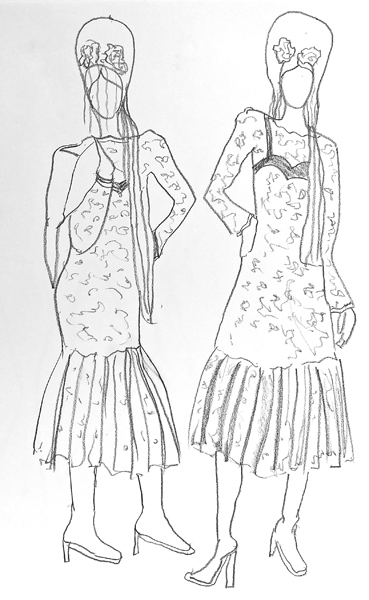 I am still really enjoying my FIT Illustration Class called Fashion Applications. Last night we started to talk about elongating the figure, and I learned that was a convention that began in the late 1800s when women were wearing long dresses. Instead of the normal body length, which is 8 heads long, the fashion figure is 9-10 heads long. It will take me awhile to achieve those proportions for our drawings, but I wanted to record some progress here since mid-semester. 1. 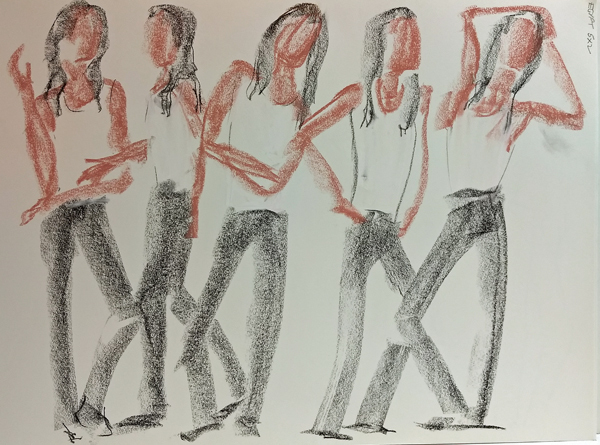 I am still using Nu-Pastel chalk to draw the 2 minute warm-up poses. They are fun for loosening up, and I'm glad I finally tried them! 2. 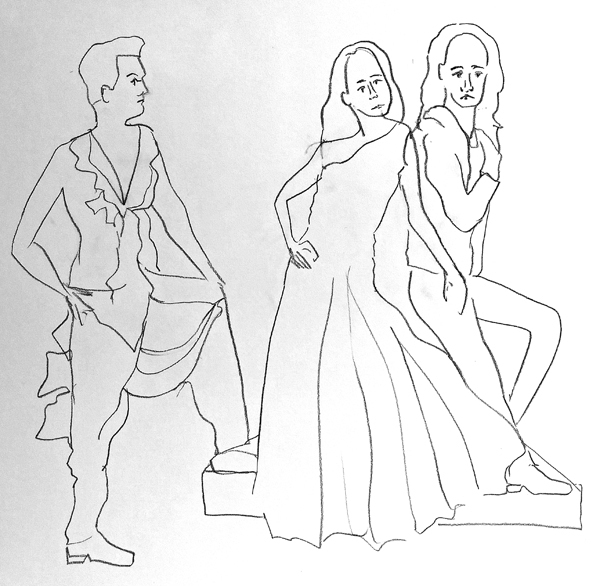 I can draw a figure and even add detail from a costume with 7 minute poses. The model had on red leather boots to go with her red and black Spanish costume. 3. 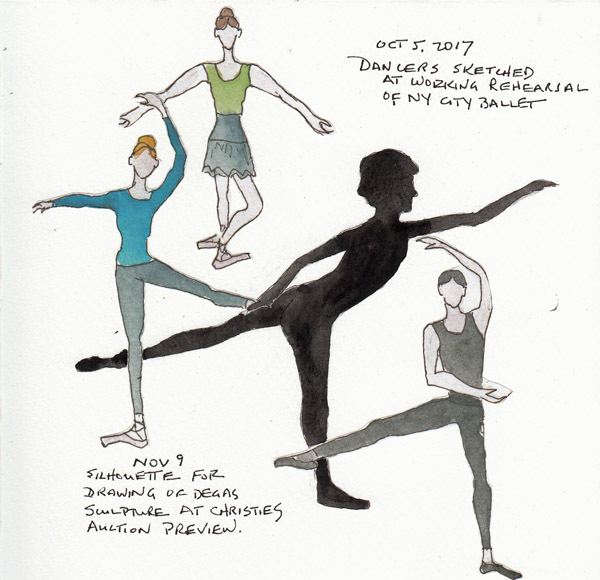 At the end of a 3 hour class, with many single and double figure poses, I was loose enough to draw 3 figures together in 10 minutes. 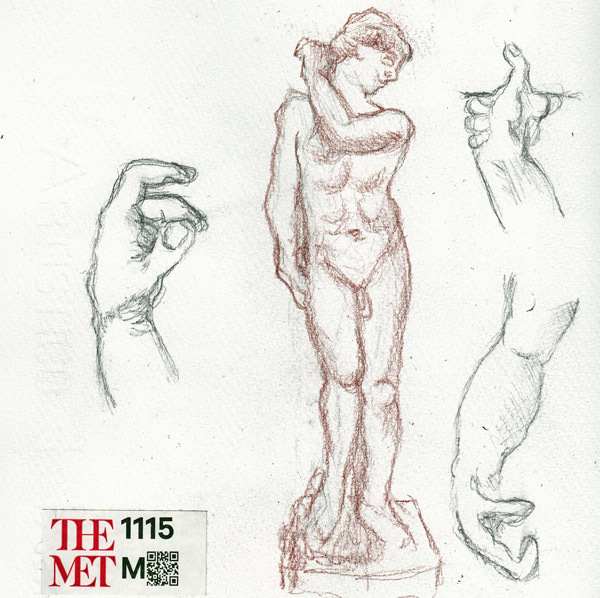 For anyone interested in figure drawing, this is a very structured learning experience. 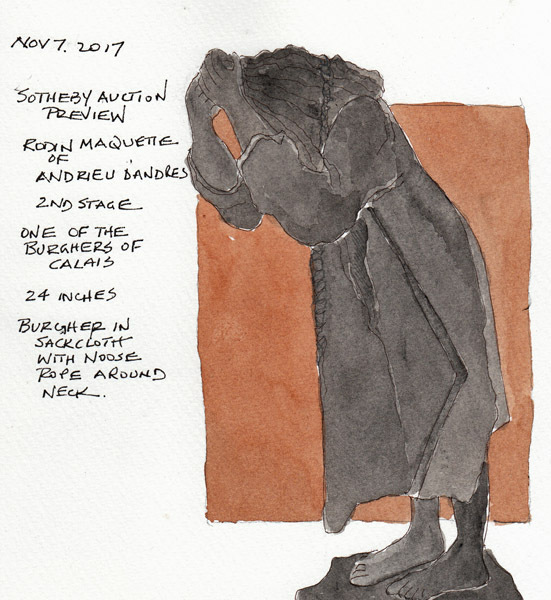 I missed the class on Mapping the Figure, where you begin drawing the whole figure in a limited number of big separate shapes, and then fill in the internal details. I will need to try this on my own to see if I can do it! 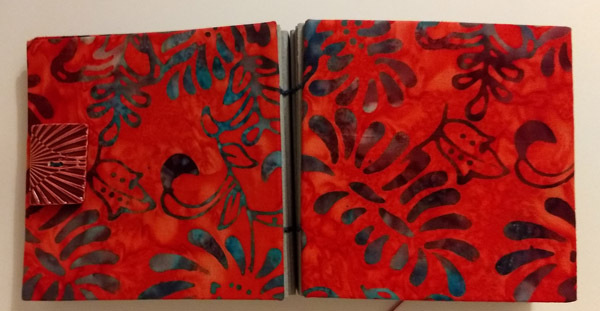 I love making sketchbooks and devoted several accordion books, with 140 lb watercolor paper, to my days with the NYC Urban Sketchers. This book took a little more than a year to fill, partly because I didn't always use it when I was sketching with the group. This is the front of the book. We met at the Hans Christian Anderson Statue for the Saturday morning Storytelling Program when one of our members was performing. 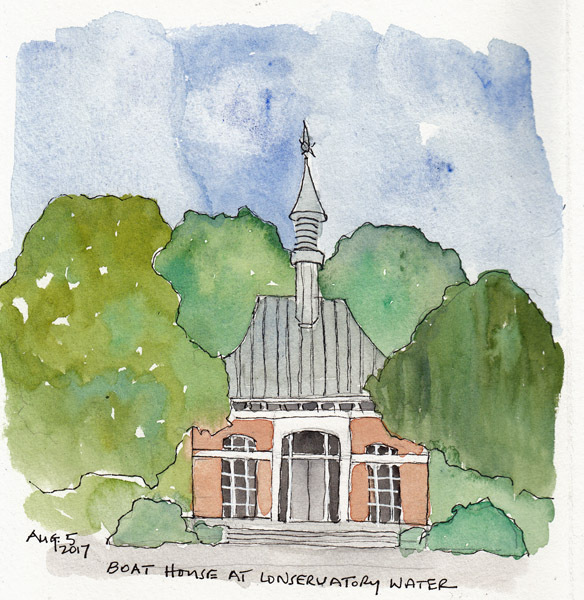 I sketched the Boat Rental Building at Conservatory Water in Central Park and never posted it. 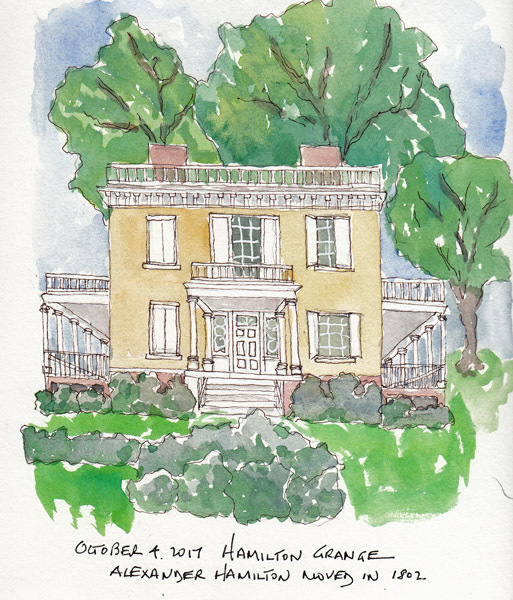 Recently our weekday USK group went to the Hamilton Grange in Manhattan, the Summer Home that Alexander Hamilton built and lived in for several years at the end of his life. It is beautiful, and easy to access from midtown Manhattan, at 414 W 141st St.